Laura Sewell is one of the Superfine Dinettes. Laura is also one of the choreographers for the Dinettes’ dance moves at the Mermaid Parade and for other shows at Superfine. 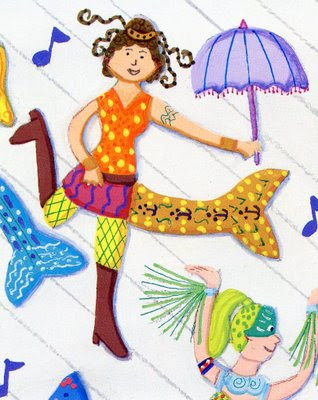 She also taught me how to make a mermaid tail which became an activity in MERMAIDS ON PARADE. Q: What is your mermaid name? How did you arrive at that name? LS: Gina de la Mer. Gina is short for Regina, which means Queen in Latin, and de la Mer means "of the sea" in French. Q: How long have you been a Superfine Dinette? LS: I've been with the Dinettes from the very beginning, 2002. Mermaidra (Tanya Rynd) asked me to show some hula moves I picked up in Hawaii to her East River friends; the next thing we knew we were Dinettes. Q: What is your contribution to the Dinettes for the Mermaid Parade? LS: I help the Dinettes create something from their ideas, realize their dreams. That means coordinating the logistics involved, from inviting everyone to rehearsal to writing down the movements in the order we've decided. Being like a constant rock in the sea through the process, while the group creativity swirls around. Helping the new ones decorate their tails (like I did with you, MerMel) and apply their false eyelashes on the bus. So our diverse group of amateur performers hits the parade with the confidence and charisma of seasoned pros. Q: What does Coney Island represent to you? LS: At the turn of the century, Coney was another planet just a subway ride away: Dreamland and Luna Park were fantastic, magical, world-class. The wonderfully inventive spirit of the Mermaid Parade honors those memories with our annual sprinkle of glitter on her sands. But Coney Island deserves to sparkle every day! LS: I do visual styling and production work for top-notch commercial clients. You can see some of the beautiful images I've helped create at my website. I've long wanted to expand the definition of myself as an artist to use more of my brain-storming, big-picture talents. The Municipal Art Society's "Imagine Coney" initiative gave the public an opportunity to submit their ideas for the future of Coney Island. You can see the ideas, including some of what I was inspired to write (#206-211 in the gallery section) here. I also hope to apply my gift for mobilizing people (and mermaids!) to including disenfranchised Coney lovers in the local government processes that will determine it's future. * Laura Sewell on the Superfine bus going to the Mermaid Parade.